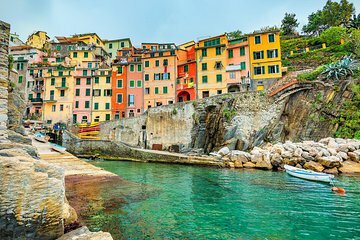 Explore the coastline of Cinque Terre by sea with this full-day yacht tour. See colorful houses and rows of vineyards on the cliff tops. Cruise through the scenic Golfo dei Poeti and discover peaceful coves and sea caverns during the journey. Get into the water to cool off with swimming or snorkeling. Snacks, a light lunch, and local wines are included.